Saints star Samu Manoa has been shortlised for the Green Flag forward of the season award. Manoa is one of five men nominated for the prize, which is based on performances in the Aviva Premiership. Exeter pair Dave Ewers and Thomas Waldrom, Wasps No.8 Nathan Hughes and Saracens man Billy Vunipola join the Northampton player in the running. 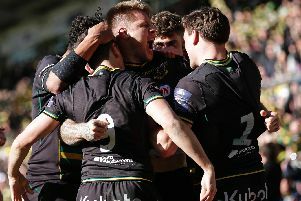 The winner will be announced at the Aviva Premiership Rugby awards, which take place at the London Hilton on Park Lane on May 20. “More than a dozen impressive contenders emerged from our deliberations and it was tough to get down to these five,” said Rugby World Cup winner and Green Flag Ambassador, Neil Back. “Needless to say I’m delighted to see so many back row players making the list! “There’s a great mixture of young and more established talent competing for the title.